The proposed 'NHS Commission' lacks red lines on the founding principles of the NHS - that it is comprehensive and publicly funded - and so risks becoming a vehicle for privateers. 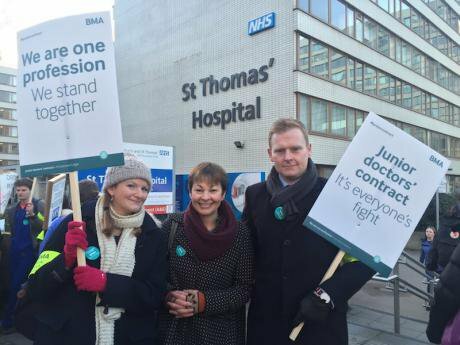 Any meaningful cross-party discussion about the future of our NHS ought to be an opportunity to fully explore reinstating it as a genuine public service – publicly paid for and publicly provided. That means ending the inefficient internal and external market, and the fragmentation and waste of private companies bidding for and running our services. And, of course, we should be talking about money too – we should spend a greater share of our GDP on health. Critically, we also need action on prevention. Mental health and wellbeing services and public health have too long been the recipients of warm words, neglect and budget cuts. Prevention through integrated social care should be a central priority. In the depressing context of five more years of Tory outsourcing under the Coalition's Health and Social Care Act, I very much hoped that supporting the idea of an independent, cross-party commission on the future of our health and social care service, could help ensure the vital arguments for keeping our NHS public were not further side-lined in Westminster. I have always favoured getting people from all sides into a room. But there are clear red lines – or there should be. Having listened to the recent parliamentary debate on whether a commission should go ahead, I have concluded that too many lines could be crossed. I have therefore withdrawn my support for the NHS Commission Bill. Without a fundamental commitment from all involved, to the NHS as a taxpayer funded, publicly provided, publicly accountable, universal, comprehensive, equitable and free at the point of use health care system for all, a Commission runs a serious risk of becoming a vehicle for privateers, to further profit from the fracturing of the NHS. I agree that there is an ‘existential threat’ to our NHS. But I disagree profoundly with the likes of Alan Milburn on where it comes from. Why is one of the central architects of private sector encroachment into the NHS - someone who represents big business, not ordinary people - now backing the commission idea? Without cross-party buy-in, a commission is unlikely to even happen, let alone be a space for an independent process that safeguards our public health service. In parliament, expert backbench voices including Valerie Vaz, Sarah Wollaston and Debbie Abrahams questioned the need for a commission. Philippa Whitford also made the case for political decisions and actions now - pointing out that we cannot develop the social care integration all agree on, if what we are actually developing is fragmentation and competition. And the Shadow Secretary of State, Heidi Alexander made it clear she was not behind the commission concept either. I know that some of those calling for a commission understand integrated social care is a vital issue, and are motivated by a genuine desire to see this happen. Political delay over social care harms people and wastes money. But much cross party work has been done already – no-one disagrees about integration but there isn’t enough action. It’s time to abolish the false distinction between nursing and personal care and at the same time put our NHS back together. It’s also time to be honest: we can afford to look after everyone’s health care needs, we just need the political will to do it. Whilst in theory a Commission could help deliver that, it’s not going to happen until there’s explicit recognition from those championing a Commission, of the harm and daily disorganisation being caused by the Coalition’s Health and Social Care Act. Anyone who really believes in a truly public NHS, fought that Act tooth and nail. Scrapping that Act and reinstating the principles of a public NHS has to be at the heart of any project to keep it. The NHS is loved. The public model that looks after everyone is loved. And in the NHS Reinstatement Bill – not this Commission Bill - we already have a model to ensure our NHS remains for future generations. Join us as an OurNHS supporter today, and we'll keep fighting for the NHS as we know and love it - comprehensive and publicly funded.